First-time home buyer? or your home is just in need of some upgrades, this article aims to help you find the right countertop appliances that fit your budget and needs. When it comes to choosing countertop appliances the first thing you need to consider how this device will help with your kitchen tasks and how frequently you will use it?! Countertop appliances are a great addition to your kitchen, they could manage every kitchen tasks efficiently, reducing time, efforts, give you the freedom to multitask and bring a diversity of convenience to your kitchen. Do you need a stand mixer? Yes, you need one, they are a beautiful addition to your kitchen besides they are perfect in many kitchen tasks, but which mixer should you buy a stand one or handheld? Indeed its all depend on your budget, counter-top space, and baking style if you don’t make marshmallows, bread and another heavy duty recipe a hand mixer could be more than enough, but if you are looking for a stand mixer that could handle more heavy tasks then a stand mixer is the one to consider, there are many models on the market but I do prefer the ones that feature a power hub such as KitchenAid and ankarsrum, which both brands provide you with wide range of attachments from pasta maker and ice cream attachments to meat grinder and grain mill. If you have a free counter space then a convection oven is a must, since it offers you much flexibility, and more energy efficient than a normal conventional oven. and it allows you to bake without heating up your whole kitchen. it can bake anything you throw into it from cookies and cakes to pizza and pies. What is the best countertop convection oven? Here is a full review of the best convection ovens to buy in 2018. Another must-have counter-top appliance that is ideal for many kitchen tasks. If you are one of those cooks who’s making lots of prep tasks, then consider buying one, especially if you are short on time or have a physical limitation. A food processor can shred, dice, chop, puree and knead. Check out the best food processors for every budget. There are many counter-top appliances you can buy to make your kitchen tasks more convenient and enjoyable, alright, a blender is one of them. it is ideal for making home-made sauces, salad dressing, Cremer soups, smoothies, ice cream shakes, and protein shakes of course. Are you looking for the best kitchen Blender on the market 2018? Read our reviews to find out top 4 best Kitchen Blenders For the money. Who wants to cook for hours after a long day of work? A pressure cooker is what you need for making meals as fast as possible it can cut your cooking time up to two-thirds without losing the best flavors. For instance, with a pressure cooker, it takes a 1 hour to make a goat stew instead if 8 hours and to cook dried beans takes less than 1 hour compared to 2 hours and not to mention the soaking for overnight. And since pressure cooker used the trapped steam for cooking, so its more energy efficient than other cooking methods, besides pressure cookers are more nutritions value than boiling or streaming, as result, the cooking time is shorter and nutrition not escaping through the steam. With the extra heat we get from pressure cookers it allows the food to get more caramelization and browning and that will bring the rich flavor of the food, and not forget that pressure cookers can cook frozen meat without even thawing. Here are the top pressure cooker models that our team of experts has selected. One of the counter-top appliances you keep thinking it is unnecessary until you purchase one, especially if you drink tea and coffee in a fair amount. Electric kettles are more energy efficient than boiling water on a stove and much faster, it is a GAME CHANGER! 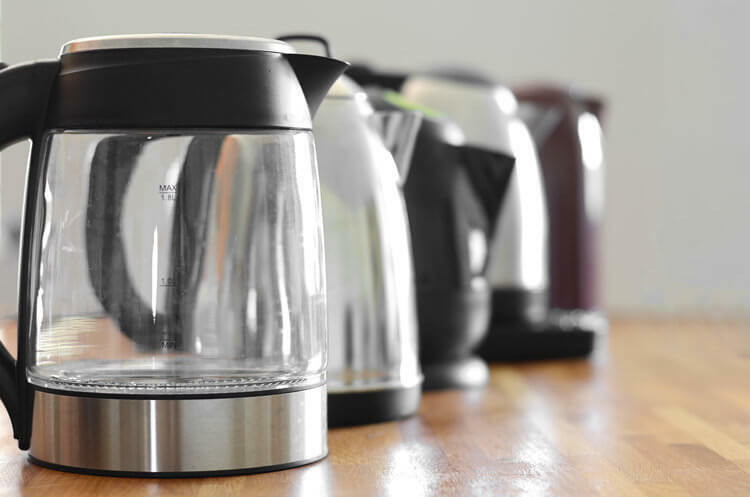 Read our reviews to find out top 3 best Cordless Electric Kettles. Pressure Cooker versus Slow Cooker: Which One Is Right for You? COPYRIGHT © 2019 · Reviewho.COM, ALL RIGHTS RESERVED. www.Reviewho.com is a participant in the Amazon Services LLC Associates Program, an affiliate advertising program designed to provide a means for website owners to earn advertising fees by advertising and linking to Amazon.com, and any other website that may be affiliated with Amazon Service LLC Associates Program. If you want to get the best household items, at the best prices, without spending hours doing the research and comparisons yourself, we can help. Subscribe now to get notifications.